I would recommend this live action version of Cinderella to any die hard Disney fan...My only criticism is that some parts seemed a bit hokey, but no more than any other fairytale film you watch. The story of Cinderella is known and loved by all. Who hasn't seen the iconic, award winning, animated film? Now, Disney has brought the classic movie to life in a live action version that begs to be treasured just as much as the original. Poor Cinderella is the unloved servant girl of her wicked Stepmother (Cate Blanchette, Blue Jasmine ) and step sisters(Sophie McShera, Downton Abbey and Hollidau Grainger, The Borgias) after the untimely death of her beloved father. When the king invites every maiden in the land to an extravagant ball, Cinderella wishes to go as well, but is forbidden by her Stepmother. However, with the aid of her fairy Godmother (Helena Bonham Cater, The King's Speech), she manages to arrive in splendor only to sweep the prince (Richard Madden, Game of Thrones) off his feet then leave him heartbroken and searching for her as the evening ends. Lily James (Downton Abbey) played the very demanding role of Cinderella and truly did it justice, as her performance was believable and relatable. Cate Blanchett was deliciously evil as the wicked Stepmother with just a touch of sugar and spice thrown into the mix. Because the audience saw more of the Prince in this live action version than in the animated one, it was a somewhat difficult role and Richard Madden was an excellent choice in casting. Unfortunately, most of the extras on this Blu-ray were about set design rather than interviews with the cast and didn't really add much to the viewing experience. The feature that focused on the animal trainers was interesting, and showed some insight into the intracacies of working with animals throughout film production. One bonus of the Blu-ray was the animated short, Frozen Fever, which reunited viewers with the beloved characters from Disney's feature film Frozen. All of our favorite characters were back for this, as well as some new creatures. This short serves as a teaser to whet one's appetite for the upcoming highly anticipated sequel. The Blu-ray is presented in 1080p High Definition Video which enhances the viewing pleasure, showing off the beautifiul, vibrant colors througout. This is especially true during the ballroom scenes. The DTS-HDMA 7.1 audio doesn't disappoint as every line can be heard in perfect, sharp clarity. Cinderella is a film that is beautifully constructed and has lived up to it's animated predecessor. I enjoyed the acting performances as well as the scenes with the animals. I would recommend this live action version of Cinderella to any die hard Disney fan and found the movie to be appropriate for all age groups. My only criticism is that some parts seemed a bit hokey, but no more than any other fairytale film you watch. 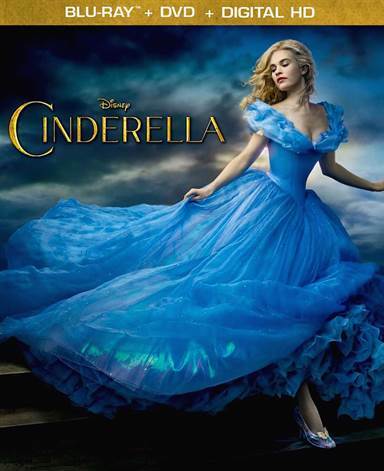 Download Cinderella from the iTunes Store in Digial HD. For more information about Cinderella visit the FlickDirect Movie Database. Ever since Emily was a young girl she has desired to be involved in the Arts. A ballerina dancer by trade, she takes time off from her love of dance to help out FlickDirect with interviews and speaking at some of our events. She especially loves reading books being made into movies including the Hunger Games series and Divergent. Read more reviews and content by Emily R Hazlett.